A telescope forms a magnified image of distant objects such as planets and stars by using lenses or mirrors, and in some cases both. It will allow you to see things in greater detail or see things that are too faint for the naked eye to detect. The moon, planets and stars will provide a lifetime of viewing enjoyment for someone who knows how to use a telescope. Place the telescope in a level, open area, unobstructed by trees, buildings and bright street lights and clear of ground clutter that could trip you during your observing session. Extend the legs fully and make sure that the telescope is stable and that the telescope tube moves freely with just a slight amount of resistance. Select an eyepiece with the largest number marked on the side (you will probably have a 9 mm and a 25 mm) as this will give you the widest field-of-view and will make finding your target easier. Place the eyepiece in the draw-tube and lock it into place using the finger screw on the draw-tube. Select a target (begin with the moon) and gently move the telescope tube to align it with the target by sighting down the length of the telescope. When you get the telescope roughly aligned, use the small finder scope on the side of the telescope to make any fine adjustments to the alignment. Lock the telescope into place by finger-tightening the locks found on the mount so that the telescope does not move. Make final adjustments to center the target in the eyepiece using your hand or the tracking knobs. Because the moon is relatively close to Earth, only a portion of it may be visible in the eyepiece. Rotate the focusing knob until you have a clear image. After focusing, remove your hands from the telescope and allow the wobble to stop so that you have a steady view. Follow the movement of the target across your field of view as the earth rotates by using the tracking knobs or gently guiding the telescope with your hands. Make focus adjustments periodically to keep your target view sharp and clear. You may need to reposition your seat depending on how the telescope is pointed. 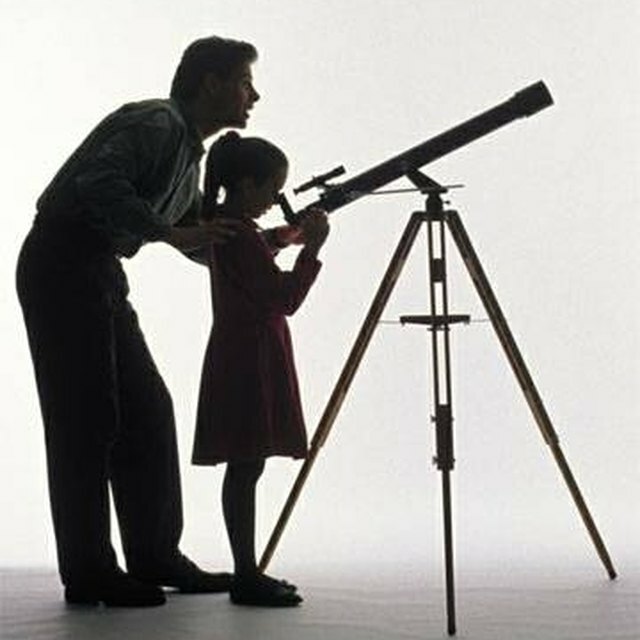 -Using a telescope to observe distant, small objects takes time and patience. It can be frustrating if you attempt too much too soon, so give yourself time to become accustomed to your telescope, the night sky, and the darkness. -Bear in mind that atmospheric conditions and the quality of your telescope and eyepiece will determine how clear and sharp a view you can achieve. Crystal clarity may not always be possible. Living in Tucson, Gerry Arlen Good has been writing for 34 years in a wide variety of environments including government, military and business. Good received a B.S. in psychology from Fitchburg State College and is a graduate of the U.S. Army Command & General Staff College. Arlen, Gerry. "How to Use a Tasco Telescope." Sciencing, https://sciencing.com/use-tasco-telescope-5601589.html. 24 April 2017.